We are instrumental in the manufacturing of this range of Solufeed Bentonite Sulphur. This is an elemental sulphur, available in various quantities. 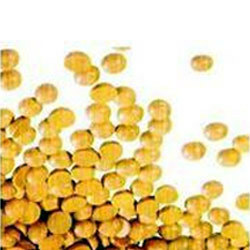 Not to be used as a nutrient, this is an insoluble compound having elemental sulphur in granules. It takes very long time before it releases into the soil. It cannot be solved by combing the elemental sulphur with Bentonite that is a type of clay for enhancing the volume by factor of 3 to 5 when it came into contact with water. Known for the consistent size, it has a free flowing and easy to apply material. Our range has very minute dust content thus, if conforms to highest environmental standards. Looking for Bentonite Sulphur ?